I'm currently freaking out a just a tad. It's already the middle of September and it's 6 months until our wedding. How did this happen?! I feel like we got engaged YESTERDAY! I got so anxious last night thinking about the fact that I haven't booked hardly any vendors, that Thomas and I hunkered down with a bottle of wine and spent our Friday night scrolling through Pinterest, emailing vendors, figuring out seating arrangements, and looking at wedding shoe inspiration. Poor guy. He was a good sport and it's actually fun and so much easier to do together. With a little sleep and a good chunk of planning under our belts, I feel a lot better today. Which is why I'm spending my morning relaxing a bit and baking this amazing chocolate chip zucchini bread. One of my co-workers has a garden and I guess the zucchini is growing like crazy, so she gave me a bunch to take home! Veggies mixed into something sweet...never did I think I would enjoy such a thing. BUT IT'S AMAZING. This bread is so moist, filled with chocolate in every bite, and is surprisingly healthy compared to other dessert breads! 2) Prepare a 8x4 loaf pan by greasing the bottom and sides (you can grease with coconut oil, butter, or PAM cooking spray) Lightly dust with flour and shake out excess flour. 3) In a medium bowl, add flour, baking powder, baking soda, salt, ground cinnamon, and ground nutmeg. Whisk together. 4) In a large bowl, add honey, unsweetened applesauce, coconut oil, egg, and vanilla extract. Whisk together until smooth. 5) Slowly add the dry ingredients to the wet ingredients until everything is combined. 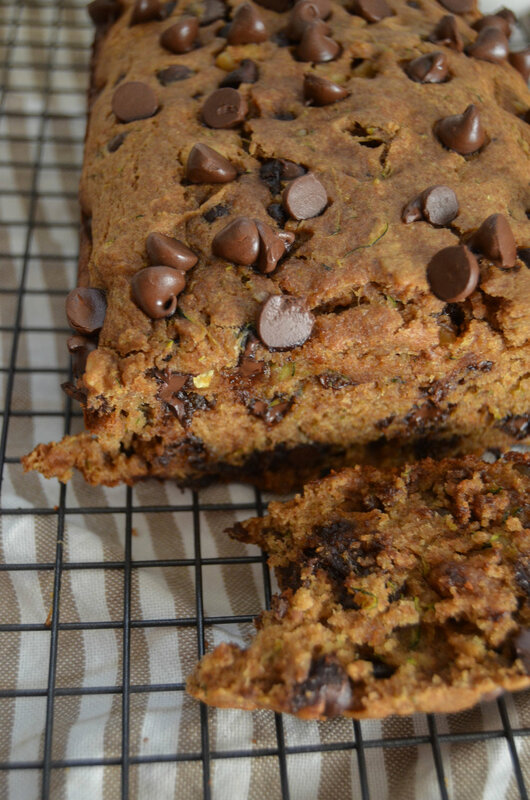 6) Fold in the zucchini, chocolate chip, and walnuts. Add the batter to prepared loaf pan. 8) Bake for 35-40 minutes, or until a toothpick comes out clean.